My first reaction is that seldom have I seen a more partisan, non-substantive movement. Democratic candidates for president, Hillary Clinton and Bernie Sanders, quickly embraced the movement’s insistence that systemic racism defines this country. In other words, we’re a nation of racists. In other words, our cops are craven, racist killers. And in other words, the entire leadership of the Democratic Party has bought into the movement’s belief system, not some. This is a very partisan issue, notwithstanding the Quiner’s Diner reader’s contention stated at the outset. Michael Brown was unarmed. In fact, grand jury testimony revealed Mr. Brown was attempting to grab the officer’s gun to use against him. Mr. Brown was shot for stealing some cigars. In fact, he was caught on video robbing a store, which is why police contacted him. After trying to get the officer’s gun in the ensuing scuffle, he walked away, only to turn around and charge the officer. Mr. Brown was 6′ 4″ and 300 hundred pounds. The office fired in self-defense, according to eye witnesses. Mr. Brown was “executed” while trying to surrender. Again, eye witness accounts disproved this narrative. The rush to judgement by Black activists, social media, the mainstream media, and Democratic politicians before our legal system had completed its investigation has led to violence and destruction throughout the country. Okay, let’s set aside the false narrative of Michael Brown’s “execution” by the cops. Surely, there IS systemic racism in police departments throughout the rest of the country, right? Let’s check. • Those 662 white and Hispanic victims of police shootings would make up 12% of all white and Hispanic homicide deaths. That is three times the proportion of black deaths that result from police shootings. • According to the Bureau of Justice Statistics, blacks were charged with 62% of all robberies, 57% of murders and 45% of assaults in the 75 largest U.S. counties in 2009, though they made up roughly 15% of the population there. • According to FBI data, 40% of cop killers have been black. Officers are killed by blacks at a rate 2.5 times higher than the rate at which blacks are killed by police. • A March 2015 Justice Department report on the Philadelphia Police Department found that black and Hispanic officers were much more likely than white officers to shoot blacks based on “threat misperception”—that is, the mistaken belief that a civilian is armed. • A 2015 study by University of Pennsylvania criminologist Greg Ridgeway, formerly acting director of the National Institute of Justice, found that, at a crime scene where gunfire is involved, black officers in the New York City Police Department were 3.3 times more likely to discharge their weapons than other officers at the scene. Data does not support the narrative that ‘systemic’ racism pervades our police departments. Although I do not dismiss the entire BLM movement, it seems that they, along with their allies in the media and the Democratic Party, have chosen to demagogue the issue and spread mistruths and outright lies. This is no way to have a national dialogue on race. The data, most of which was culled during the Obama years, contradicts the BLM narrative. I appreciate your response, though. What is your personal experience? Personal experience as far as what? Have you had personal experience in terms of “inequitable treatment by law enforcement.” This is a sincere question. Is it a requirement? When I replied to your blog post I was referring to the #blacklivesmatter movement. But, yes I have experienced inequitable treatment by law enforcement, though I don’t see why that’s relevant. No, not a requirement. Just asking since it was related to the topic. Understood. 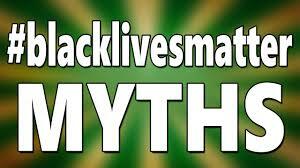 But why do you think that the Black Lives Matter movement is defined by mythology? Because the data, which I presented in my piece, doesn’t support the premise of systemic racism as espoused by BLM. Although it is true that YOU presented data that doesn’t support systemic racism it doesn’t negate the fact that Blacks are treated differently in this country by law enforcement. Fair point. Why do you think that is? Blacks are perceived as being more violent, more threatening. Which is ironic because America was founded on Anglo violence of White men attempting to exterminate the Indigenous and enslaving Africans. This was breath of fresh air. I am a student about to dive into the world of discussion on the subject of BLM and compare it to the Civil Rights Movement of the 60’s. I am so glad to have come across your post. Supported by facts. I am sick of all of these social issues and politics plastered on all social media, television sets and papers. There is a long road ahead and this is just the beginning, but I am relieved to have read your post. Thank you for taking the time to research and present facts. I would like to ask this question to BLM folks; do citizens need to listen to police, heed commands, or respond respectfully to questions? What would BLM approve of as proper law-enforcement responses to contempt, defiance, assault, assault with a deadly weapon? Great article with supporting facts.